Marie Duplessis, 19th-century French courtesan, socialite, literary muse and all-round party girl who died just after her 23rd birthday and whose life inspired artists from Alexandre Dumas, Giuseppe Verdi all the way to Baz Luhrmann, returns from the grave for one last party at the Fairfax Studio – and this one is going to be a killer! Songs for the Fallen is a fabulous melange of tragic musical, bawdy cabaret and pumping pop opera, the writing of Sheridan Harbridge and music by Basil Hogios finding a pulsating and contemporary vitality, appropriate for this story of the original ‘material girl’! The set by Michael Hankin recalls the decaying remains of a 19th-century French apartment but easily transforms into a drug-crazed disco or demented vaudevillian circus upon demand. 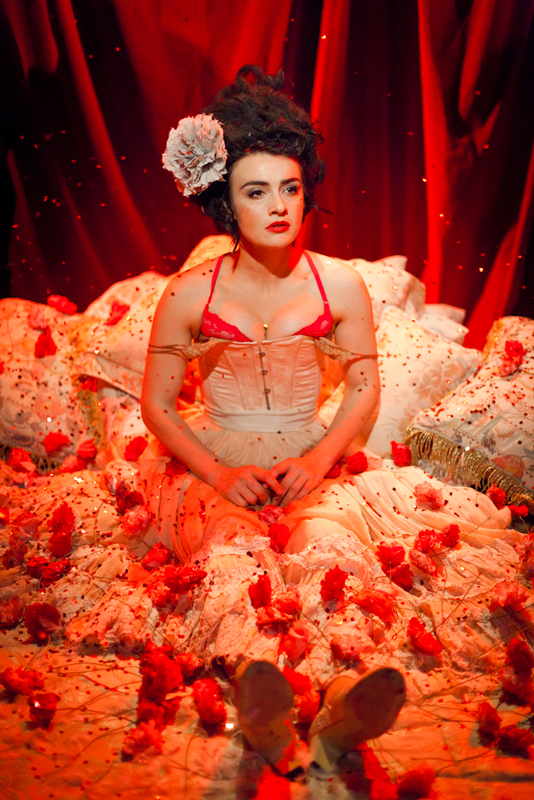 Harbridge in the role of Marie Duplessis is a dynamo, a slender and fragile figure with a huge voice encased in fabulous corsets and garters who claims centre stage, shamelessly courts and molests the audience from the get-go and whose boundless charisma never lets up. She is aided by two versatile fellow performers, Simon Corfield and Ashley Hawkes, who assume the roles of various characters as we are taken on a burlesque and irreverent retelling of Marie’s rags-to-riches-and-back-again story. The three work so seamlessly and effortlessly together that they produce the energy and character of an ensemble of ten! Hogios’ score wonderfully and tunefully captures the seductively lush materialism of Marie’s existence in thumping dance beats, as well as her despair at its fragility and lack of inner purpose in gorgeous pop ballads. It is a credit to the show that even as it pokes fun at any pretence of seriousness or accuracy to the historical context, a beating and wounded heart lurks beneath the surface. Songs for the Fallen captures, better perhaps than any other derivative depiction of Duplessis, the tragic dimension of this complex woman who clawed her way up from the gutter, living in brief splendour only to be consumed by incurable illness that left her alone, wretched and friendless before her death. Refusing to draw a moral or produce judgement, Songs for the Fallen heart-breakingly communicates the senseless and unjust cruelties of the world at the same time it embraces the joy and immaculate pleasure of simply being alive. Venue: Fairfax Studio, The Arts Centre, 100 St Kilda Rd.